A fast car with flashy paint is worthless without a solid suspension and great brakes. Taking care of everything now will eliminate having to fix things piecemeal in the future. 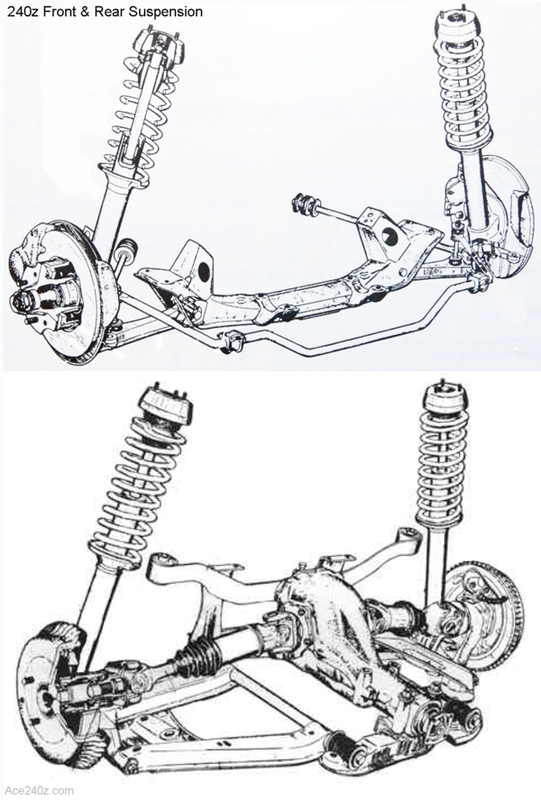 The top image is the front suspension and below is the rear. The design is a little primitive compared to modern cars, but in 1970 an independent rear suspension was a rarity. With some upgrades, it can still be competitive. One such upgrade is polyurethane bushings, which make for a tighter, more responsive suspension. Factory bushings are made with rubber, which are a little "squishy", but they provide a slightly softer ride. Since I won't be racing or drifting, I opted for the rubber versions. 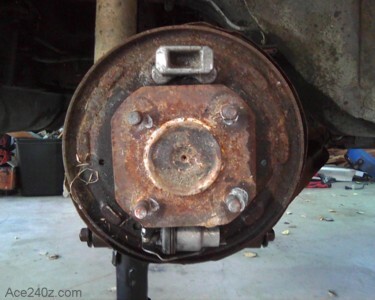 The rear suspension was rebuilt early because their were no brakes (see below). The dust covers were crushed. The previous owner included a salvaged 280z suspension to provid the missing parts. 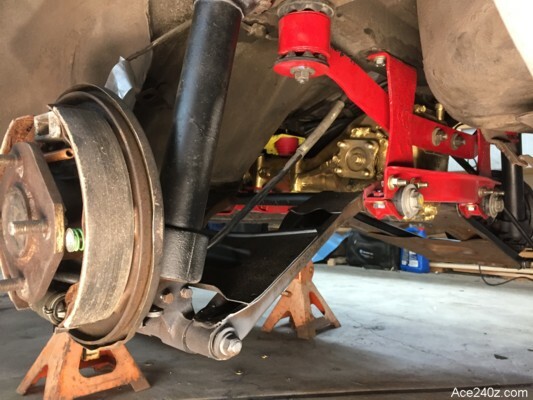 Once everything was sorted out, new bushings were installed along with upgraded struts. New brake shoes and slave cylinders were added. The hubs were pulled apart and new bearings and seals were installed. The existing bearings were probably fine, but this is yet-another instance of the "while I'm here..." cost overruns. The front suspension was time consuming. As always, the car fights back. Like with the rear, the bushings and ball joints were replaced, along with tie rod joints, bearings, seals, and so on. I added steel reinforcement plates for the sway bar mounts because 46 years of flexing can really loosen things up. I put the steering wheel back on and was able to turn the tires for the first time in over a year. The steering rack was bolted on and new bellows will keep it clean. I'll need to have wheels aligned but that can wait until later. The previous owner said the car had no brakes. Typically that means something is broken or worn out, but this time it was really "no brakes" because when I pulled off the drums I discovered there was nothing - no shoes, no springs, and the slave cylinders were corroded beyond repair. Everything had to be replaced. By contrast, the front brakes were in pretty good shape. Nothing was leaking and the rotors weren't warped, so all I did was replace the pads. The original pads looked OK but were an unknown quality, so they got tossed. Here's how the rear suspension turned out. Typically I would have painted everything black, but doing it red made me laugh. It'll match the body color. Everything is held together with grade-8 hardware, which is probably overkill compared to what Datsun used in '71. I won't be racing or drifting (although I might do a few track days) but knowing I used extra-strong bolts gives some piece of mind. The new brakes look great. The stock cylinders turned out to be pricey, so I used ones for a 280z. They bolted right in but the hard lines had to be carefully tweaked to get them to line up.